I vividly remember when my neighbor two doors down got an Atari 2600 in 1978. 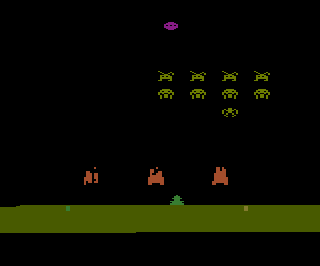 I was probably 4 1/2, maybe 5, but I remember the first time I saw Space Invaders. It was the only game they had. My brothers and I pooled our allowances for a while and bought our own. Combat quickly became my favorite game. You could ricochet bullets from the tanks off the walls! My brothers didn’t stand a chance. Fast forward to 2008 and I decided to go find an Atari emulator. A few minutes later, I was playing Space Invaders again. Combat in the emulator wasn’t fun because I had no one to play with. I really cut my computer teeth on the C64. I remember when I’d walked into Electronics Boutique in the mall and see a wall full of C64 games. A few years later, there was a small “IBC PC” games section. The C64 was great. I spent a lot of time playing games on my C64, but I’d also try to write programs. I remember I was able to make a few basic sprites move across the page, but I had no idea what sprites really were. I remember trying to type in programs I’d find in a book or computer magazine. They never worked. All that mattered to an 8 or 10 year old is playing games. There was one game in particular that I really fell in love with on the C64: Ultima IV, Quest of the Avatar. It exposed me to my first game with any depth and to a persistent world that I’d live in while playing the game. I was mesmerized. I spent countless hours exploring every nook and cranny in Britannia, figuring things out (I copied the game and didn’t have the manual), immersing myself in the story, and I loved every minute of it. I was probably 11 or 12 years old. A close friend of mine always had a PC. I remember playing games with him on his 286 and 386. Police Quest and Chopper Commando were our favorites. He had to start the games from the command line. All the time we had a computer, we used it for word processing. I’d type book reports or other papers on the computer and print them on my dot matrix printer. During my early college days, I worked for a small financial planning firm where I maintained their software (by keeping versions up to date with frequent update disks from insurance carriers and other financial services firms) and created spreadsheets for the agents in Lotus 1-2-3. I’d never even heard of Excel, but I’d gotten my first exposure to early Windows. I think it was Windows 3.1. I left school to enlist in the Navy where I qualified to train as a Navy Intelligence Specialist. After training, I deployed to the USS Independence in Japan, where I pulled intelligence reports from a computer in the SCIF for the ship’s intel officer. Little did I know it, but it was the internet. Well, it was the government’s classified version of the internet, but looking back now, I can clearly remember clicking on links, printing the pages, and preparing a report for the department Commander. After the Navy, I went back to finish school. A few of my friends had just gotten email and they told me to look into it. I remember using Pine in the school library to read my email. I didn’t have much email then. I don’t remember how I learned of it, but my life changed when I learned that Ultima Online existed. Here it was, the game I loved at a kid, the world I spent years exploring (literally, through Ultima 4, 5, & 6), in a new online game! I bought my first computer explicitly for the purpose of playing Ultima Online. It had a 300Mhz processor, 64mb of RAM, and I forget the size of the drive. It ran Windows 98. And that was the biggest timesink I had heretofore discovered in my life. Soon, I ran across Ultima Offline eXperiment (UOX), which was (still is) an open source version of UO Server. It was created by a group of hackers to run the UO client. It allowed someone to have their own private game server with a world devoid of people except for those you invite. I remember I organized a tournament with 8 people with me both playing and hosting the server. I didn’t know anything about performance then, but I can laugh at myself in retrospect for thinking I can host 8 active players in a networked game on a 300Mhz machine. It crashed all the time, but it didn’t matter. I was completely amazed that people could do this. I browsed the source code. I knew it was something called “C++”, but I had no idea what I was looking at, yet I thought it looked beautiful. It may have been a kludgefest of cruft for I know, but I fell in love with code, with how it looked, and with what it could do. So I decided to learn what this code stuff was all about. I bought Sam’s Teach Yourself Java in 21 Days. I installed Java 1.1 and learned Hello, World. Soon thereafter I was writing a program to feed a Jabbywocky. I still don’t know what a Jabbywocky is. I didn’t finish the book. Some of the concepts were over my head, and I could tell that it was all trite and contrived. I wasn’t going to be able to run a UO Server emulator after reading that book. Here we are, a decade later, and I’m busy integrating legacy applications into our shiny new message bus. It’s highly concurrent, runs all our integrated applications in a single JVM but in isolated classloaders, and my company is porting all our automation and data processing to my message bus for integration. It’s got massive horizontal scalability capabilities. Our Linux servers have multiple processors with multiple cores that are 100x faster than my first PC and have 500x as much memory. This current project of mine is a long way from Space Invaders. I guess 30 years will do that for you. It’s been fun thinking about how I’ve been involved with computers and software in some way (even as a consumer) for my entire life. I’m looking forward to another 30 in high technology and I’m excited to play a part. I might even learn what a Jabberwocky is. This entry was posted on April 20, 2008, 12:53 am and is filed under Engineering. You can follow any responses to this entry through RSS 2.0. You can leave a response, or trackback from your own site.